Wonderful, Krista! What a warm scene for this cold winter! Snowpeople need to keep warm too. Very sweet! a sweet moment captured in your wonderful whimsical style. I love the colors and the joy on their faces….beautiful!! Thank you very much for your kind comment about my Viking. Yes he is half my life. I hope you are filled with love today and always. Tsup! The colours in this illo are beautiful! Really sweet, I love the little birdie! Hahahahahah! This is so cute!!! If the snowmen wear sweaters then I can wear a hoodie to bed! I am so cold. Is it age? Ugh. Everybody else is wearing tshirts and shorts and I am all bundled up. Love the banner at the top too! Love the palette, and the border around the outside ties everything together so beautifully. I love how it goes with the argyle on the sweater. Nice job! Lovely, the way you get that feeling happeneing between your characters – and your audience! Hahahaha, even snowpeople get the chills??? Awww, I love the joy in their faces. It’s enough to warm…well, even a snowman’s heart. Man, you get these up so quickly! 😀 Have a great weekend! ooooo goodie! 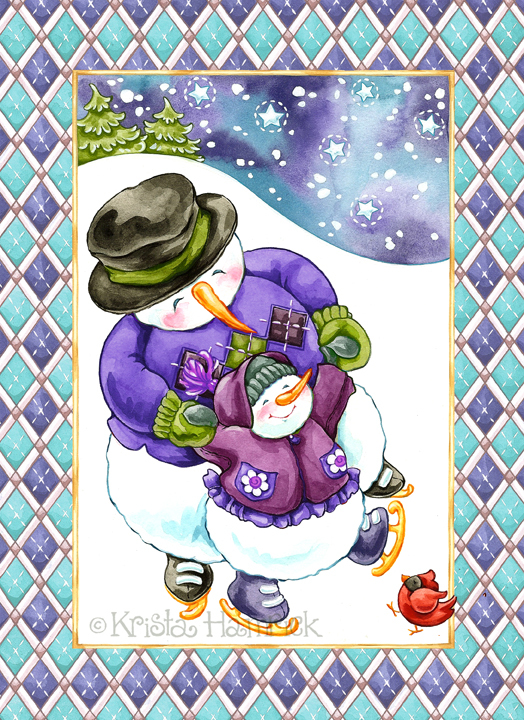 I get to see another one of your adorable snowmen!…. plus a bonus little guy! Not only have you captured the wonderful parent/child interaction and the joy of learning to skate… but your color choices are so great. Blues and purples together are one of my favorites. Your really compiled a perfect illustration of fun, love and color Krista! That little cardinal is so adorable. Looks like he’s slipping on the ice :o) Great little accent. You are so quick with the draw! God bless! Oh my, this is soooooooo adorable!!! Oh, I do love to ice skate. These two are really great. The little bird kicking up his leg, too! This is adorable. I love the luscious berry-colors too. Makes me want to lick the card. LOVE! What a wonderful piece for IF and such a great palette. The little dancing cardinal in the corner is perfect.